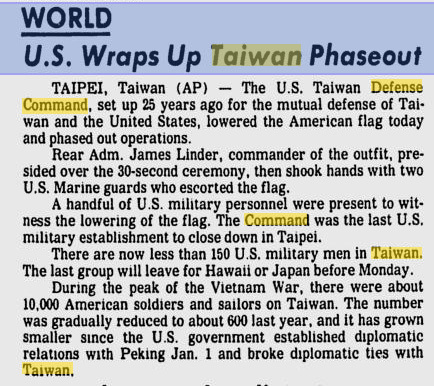 This article from the Lakeland (Florida) Ledger of April 25, 1979, describes the final lowering of the American flag in front of the U.S. Taiwan Defense Command. 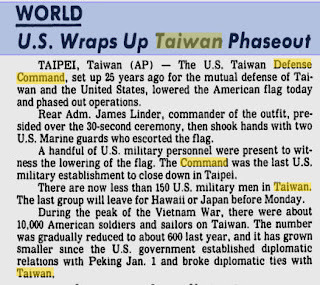 I've written several pieces about the final days of TDC, but I've often wondered who the last "official" military person to leave Taiwan was. I believe that Vice Admiral Linder's aide, Lieutenant Commander Skip Wright remained behind for a short time to finalize things, but I don't know when he physically departed. Does anyone know who was the last one out?